Pseudostem 2.5 m or taller. Leaves 1-1.5 m long, 50-80 cm wide, entire, midrib usually prominent; often tearing between pinnate veins; upper surface lustrous green, and slightly glaucous beneath; glabrous on both surfaces. Inflorescence pendent, 55-90 cm long; rachis robust, glabrous, greenish; bracts spathe-like, ovate, concave, 30-45 cm long, 10-18 cm wide, purplish red, glabrous on both surfaces; flowers many per bract, pale yellow; free tepal oblong, half as long as fused petals; periath usually 4-lobed; stamens 5, staminode one; ovary inferior, cylindrical, 2-3 cm long, glabrous. Fruit a fusoform, 4-7 cm long, 2-3.5 cm in diam., purplish red when mature; fruiting pedicel 1.5-2 cm long, greenish, glabrous. 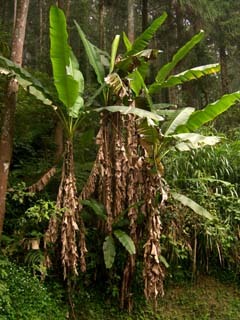 Common throughout the main island of Taiwan 200-1,800 m.
This banana grows at between 400 m to about 1800 m altitude in the mountains of the Taiwan mainland. 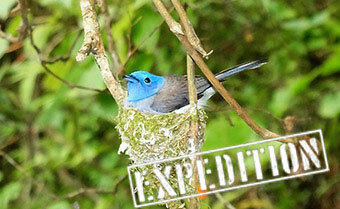 It is reasonably common in the open conifer forest at high elevation. The plant tolerates a reasonable amount of frost at this elevation. Widespread from 400 m to about 1800 m elevation in the west of mountains in Taiwan, and lower, starting at about 200 m on easterern mountain sides where it is wetter and cooler.